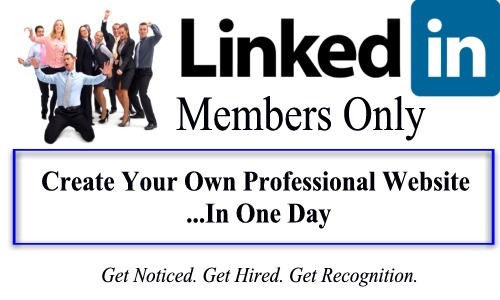 Hello and Welcome LinkedIn Professionals! This is a simple story really. I realized immediately that so many job seekers, consultants, and freelancers do not have their own website so I have resolved to do something about it. If you have your own website and write about your experience in your respective field, you will stand out! You will be selected before others! To help you achieve this, I have put together a LinkedIn member special: A Professional Website In One Day! Folks, this is what I do: create great looking websites that will make you stand out. Because I know how all of this works, I can have you up and running within one day! May 2012 Update: This offering has become very popular. It’s first come, first serve so order quickly! Sign-Up below and I will contact you within the hour by phone, chat, or email. Phone is best! I will get everything setup and provide you with instructions on how to create content on your site. That’s it. You now have a professional looking personal website to share with prospective employers, clients, and, perhaps most importantly, on your LinkedIn profile! The price for the Professional Website In A Day is currently being offered special for LinkedIn members at $399 (typically $799). This includes so many goodies including free domain name registration, free web hosting for two years, free emails accounts, and much more. But, on top of all that, I get it all set up for you immediately, in one day! Creating your own professional website doesn’t cost. It pays! So, don’t delay. Distinguish yourself with a professional website today! Click the Buy Now Button below and I will contact you within the hour! Professional Website in a Day: Any Questions? A special note to my LinkedIn counterparts. Folks, I am here for you. This solution truly sets you apart from the rest as a true professional in your field. I obviously give priority to those who have already signed up but I will certainly answer any questions that you may have. Connect with me on LinkedIn and ask away!